There was a time in my life when I could eat cinnamon raisin bread every single day for breakfast. I wasn’t that great of a baker at the time and bought my favorite brand. When I learned how to get better baking with yeast type breads, I tackled how to bake a cinnamon raising challah. It’s really not as complicated as you may think it is. I’ve shared a couple of challahs here before. This poppy seed challah is crazy good!! !I also really love this honey challah. 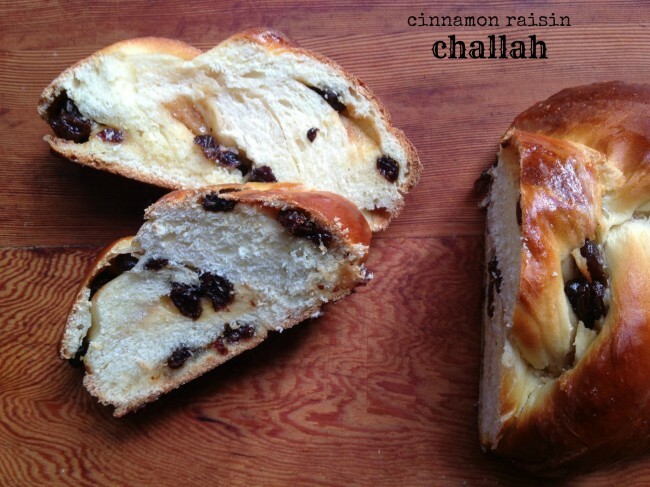 This is probably my favorite way to enjoy challah bread because, well, I love any cinnamon raisin type of a recipe. Don’t you?? I know it’s the new year and many of you are probably eating broth and juicing all day long. Heck, I dreamed of doing one of those detox juice diets for a day or two. I dreamed about it but I had no willpower to actually do it. But I did make a rockin’ lentil soup this week and it had LOTS of amazing kale in it. As good as a detox diet, maybe not. But it was homemade and it was delicious! So for my friends that aren’t afraid of some carbs for the first month of the year, you’ve got to bake this challah bread! I can’t tell you how long ago I took these photos. It’s embarrassing, really, that I have so many photos that are just waiting to be shared here. It’s not really embarrassing, but I feel badly about it when I look at my drafts and I see I have 2 lasagnas and a scattering of cakes that should’ve been published months ago. For now I will catch up with my baking and share with all of you this incredible cinnamon raisin challah. It’s truly delicious. It’s every thing you would ever wish for in a cinnamon raisin bread: light and fluffy, spicy and sweet. Someone told me I should sell this challah bread. Well, I’m not going into a challah bread baking business any time soon, but I will keep baking them when I can for my family, friends and for ME! In a mixer, with a dough hook attachment, add the warm water and yeast. Mix until blended. Add the sugar and mix about a minute. Slowly mix in 1 cup of the flour until combined. Mix in the eggs one at a time until they are combined. Add another 2 cups of the flour, oil, and salt. Mix together on medium-low speed stopping the machine to scrape down the sides of the bowl. Slowly add the rest of the flour (the remaining 4 cups) and mix until combined. Stop the machine as you add each cup of the flour to scrape the sides of the bowl and incorporate the flour. Mix on low speed for 12 minutes until dough is incorporated. Be sure to give your mixer a break and as you don’t want to burn it out. Add flour if needed 1 tablespoon at a time. The dough will be a little sticky but also firm. Take dough out of mixer bowl. Form the dough into a ball and place into an oiled bowl (when I put the dough in the bowl I swish the dough around the bottom of the bowl and then flip it over so all of the dough is covered in a light film of oil. I use vegetable oil). Cover with plastic wrap and let it rise at room temperature until doubled in size (about 1-1 1/2 hours). Punch down the dough. Divide the dough into 3 equal portions. Shape each portion into a ball, and allow it to rest with plastic wrap on it for 5-10 minutes. Roll each dough ball into long piece and then flatten to form a rectangle. Brush the top with melted butter and sprinkle with the cinnamon sugar filling. 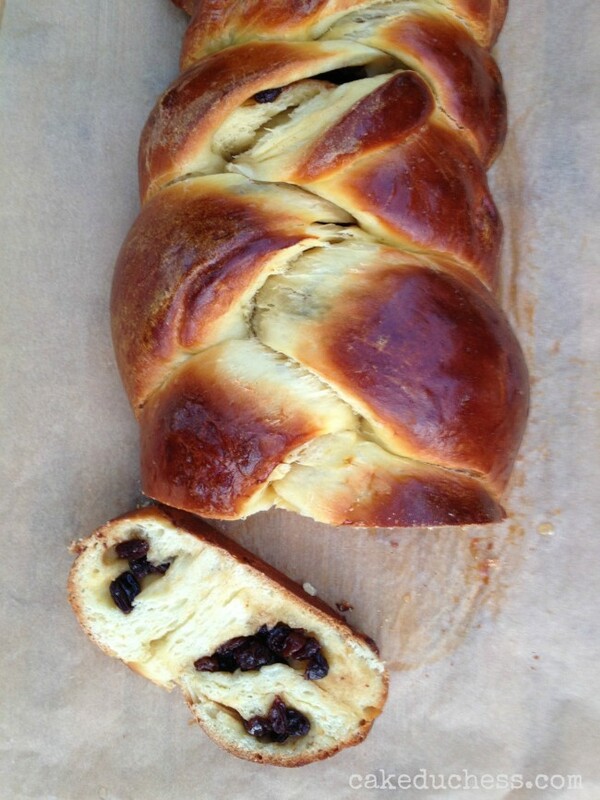 Top with raisins.Pinch together to form 3 filled strands.Braid the strands together to form a loaf. While resting, preheat oven to 350 F.
When ready to bake, brush with egg wash.
Bake the challah for 35-40 minutes (on 350 F). The bread should be golden brown. Ovens may vary so check your challah at about 30 minutes and see how it’s doing. You test if it’s done by tapping the bottom of the loaf. If it sounds hollow, it needs a bit more time. * Be careful to not burn your fingers like I did when you do that test. Let it cool and serve slightly warm or at room temperature. 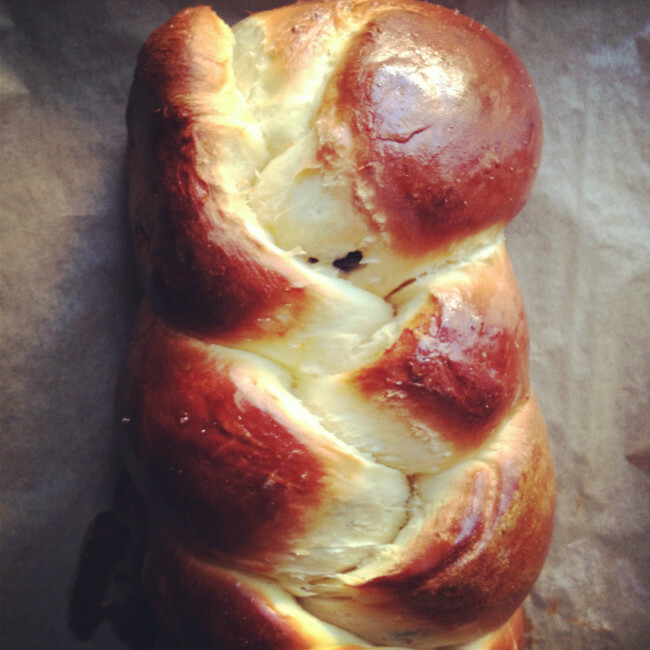 Gorgeous challah, Lora! I am not afraid of crabs ;). We always are afraid of carbs… but sometimes, like for you bread, do wrong can be very exciting! I really love you recipe! I adore challah! Love the addition of cinnamon and raisins! I bet this would make awesome french toast (I can't help but think of french toast when I see challah, haha). 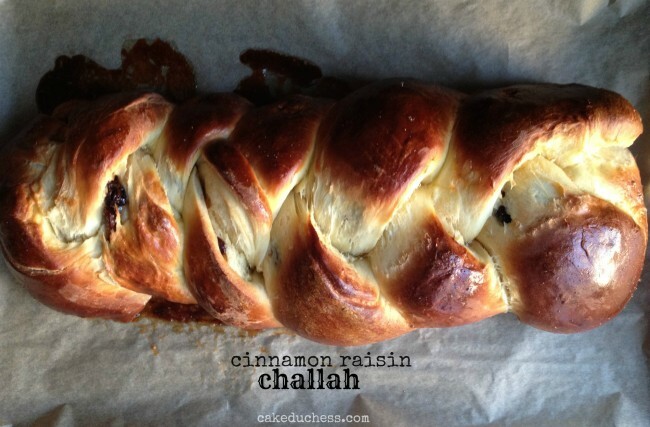 I've to try a Challah with cinnamon and raisin. Thanks for that idea. This bread looks heavenly! Love all those raisins inside! I love all your challah breads, and, as always, this one is simply beautiful!! We were at my favorite bakery today and they had just pulled out their loaves of cinnamon raisin bread. The smell was HEAVENLY. Obviously, I must recreate it at home and doesn't this recipe look perfect? Thank you for sharing, sweet Lora! I LOVE LOVE challah and this one is seriously tempting me to get in the kitchen today. Yum! Challah is on my to-bake list this year and I gotta say, I wouldn't mind wolfing down a loaf of your gorgeous cinnamon raisin challah right now! I'll never give up carbs – I just love 'em too much! Beautiful job on this loaf, Lora. I'm a big fan of flavored challah, and I particularly love raisins! Much better than regular white raisin bread too. I gave up on juice detox a long time ago, too stoic for me… There are so many other ways to eat less and healthy! And without missing on breads like this one! !